Sonic the Hedgehog 34 is the thirty-fourth issue of the Sonic the Hedgehog comic. This comic features one story: "To 'Bot or Not to 'Bot". This issue also features the Knuckles' side-story "A Sense of History", part 4 of the story. Uncle Chuck and Muttski are standing on platforms, getting zapped by Rotor's make-shift deroboticizzer. Sonic can't bare witness to the process and covers his eyes. The process ends, and Sonic opens his eyes, witnessing Uncle Chuck and Muttski still in their robotic forms. Rotor, at the machine's controls, tells him he can't get it to work. Uncle Chuck gets off the platform, trying to improve Sonic's mood by telling him that they are still themselves on the inside, and that he doesn't get tired anymore. In order to get any answers they need, Rotor asks Uncle Chuck and Muttski to go back on the platform for another test. In Robotropolis, Robotnik calls for Snively. Snively answers the call, wondering what is up, as Robotnik had been working on something for the past number of weeks. He enters Robotnik's lab, witnessing the tyrant in a general's uniform, flanked by numerous camo-wearing bots. Robotnik has declared full-out war on Sonic and the Freedom Fighters, creating the new Combot: humanoid camouflage-wearing soldiers designed to defeat the Freedom Fighters. They start to walk out of the room as Robotnik continues telling his plan, to invade the Great Forest by force and send in the Combot's to destroy the Freedom Fighters when they appear. He then orders Snively to be quiet about the plan to ensure its success. Unknown to them, outside a window near the duo, Dulcy listens in on the conversation. She takes to the skies to warn the others. Dulcy arrives back at Knothole Village and warns the others of Robotnik's plans, though mixing up some words from forgotten memory. Despite the mix-ups, Sally Acorn understands what she's saying, thinking that the only way they can stop the Combots is by destroying them while they are in one place. With plenty of knowledge of Robotropolis, Uncle Chuck and Muttski volunteer to infiltrate the city and do the job. Sonic, however, wants to join them as well. Sally agrees, letting the trio head off. The three Freedom Fighters are able to gain access to the city, and reach a control panel outside Robotnik's headquarters. While Muttski and Sonic keep their eyes out for anything, Uncle Chuck uses the control panel to get through his security systems. They successfully make it in, and walk into the room holding all the inactive Combots. With explosives on hand, Sonic runs off to take care of the job, but their effort is noticed by Robotnik via a monitor. He unleashes a massive bolt of energy that hits Uncle Chuck and Muttski. With the explosives in place and on a 2 minute fuse, Sonic runs back to Uncle Chuck...who grabs Sonic and refuses to let go. He and Muttski have returned to Robotnik's control. Held at the mercy of Uncle Chuck and Muttski, Sonic is ordered to remove the explosives, just as Robotnik and Snively enter the room. Despite the situation, Sonic makes fun of Robotnik's new general uniform, asking if he got kicked out of a marching band for swallowing a drum. Robotnik turns the joke around, mentioning that Sonic will be the one leading a parade. At the edge of the Great Forest, Sally awaits the return of Bunnie Rabbot, Antoine and Tails who were out on recon. They return, telling Sally that there was no sign of an explosion, or of Uncle Chuck, Sonic and Muttski. Sally suspects the worst, so she takes out her binoculars and looks out in the distance. She looks on, noticing Robotnik's troops heading for the forest. Robotnik and Snively are in a tank, with Sonic bolted to the front of it. She also notices Uncle Chuck and Muttski, marching with the troops as well. With a major threat on the horizon, Sally makes a hard decision, telling the others to get all the free Mobians to the underground shelters and to evacuate Knothole. After some time, Sally and the others are able to round all the Mobians and head for their underground shelter. Just as they arrive at the cave entrance, they notice Robotnik standing in front of it, with Uncle Chuck in a floating car beside him. Uncle Chuck had given out the location of the shelter. Robotnik then announces Princess Sally as his second prisoner of war. Despite the odds of failure, Sally and the others keep up a defense, ensured that Robotnik will eventually be defeated. Robotnik thinks otherwise, as his Combots have been programmed to locate all non-robotic beings and destroy them, even if they have to destroy the entire Great Forest. With all his Combots in formation near him, he orders them to remove all Mobians from the forest. Robotnik laughs at his possible victory, but Snively tries to get his attention while he's doing so. He eventually looks on at his Combots, noticing them going away from the Great Forest. He runs after them in a vain effort, as they march on toward a cliff. He can do nothing but watch, as each Combot walks off the cliff and into the water below. Despite his loss, Robotnik still has an edge as he has Sonic as his prisoner. He orders Snively to roboticize Sonic immediately, but Snively notes that he can't. Robotnik becomes infuriated at Snively's reluctance, but he notes that he is unable to do what he commands. Robotnik looks up from Snively, noticing Sonic has been freed, and is running the tank. He aims the tank's cannon at Robotnik, but Muttski runs up and stops Sonic from going any further, while Uncle Chuck arrives in the floating craft. Robotnik and Snively take the opportunity and board the craft, escaping back to Robotropolis. As the craft flies away, Sonic thanks Uncle Chuck, while Muttski has a change of heart and starts licking Sonic, confusing Antoine. Rotor arrives on the scene to explain what has happened. During his last test with Uncle Chuck and Muttski, he placed a neuro-overrider in them. Despite Robotnik's attempts to control them, the chip allowed the two to maintain their consciousness. The two had only pretended to be aligned with Robotnik, allowing Uncle Chuck to reprogram the Combots to follow his command. The one thing left to answer is how Sonic got free. Sonic answers that, stating that Uncle Chuck tied him to the tank, but not tight enough, leaving him loose enough to escape. Sally is happy to hear that everything has gone well, but is angry that she wasn't involved in the plan. Later that evening, Uncle Chuck has returned to Knothole. Now that Robotnik thinks that he and Muttski's minds are realigned, he thinks they would best operate as spies in Robotropolis. Before he goes, however, Sonic asks him to explain their plan to Antoine one last time. Antoine, aside, is still completely dazed and confused about the day's events. Continued from issue 33, Super Sonic vs Hyper Knuckles, and Knuckles' Chaotix. Knuckles is investing a set of ruins, set in a series of mind-games by Archimedes, who has kidnapped the Chaotix. He recalls what Archimedes told him once, whether his friends were important, or if the floating island was even more so. While thinking about that question, he looks up and notices the tall Mount Fate. He thinks about his father's lessons again, and the tale of the mountain, along with the Great Betrayal. The echidna culture had grown to be technologically-advanced, situated on the island of Echidnapolis around a large moat. Their island remained on the ground while their efforts to grow went as high as the clouds. The echidnas had set up an observatory in the sky, the very observatory that discovered a key event in history, the danger from above. Jordann and Kayla-La, two echidnas, charted the sky, but Kayla-La was growing tired of their lack of major discoveries. At that moment, Jordann had discovered something big, coming straight for them. Kayla-La and Jordann went to the Hall of Learning and notified the other echidnas of a large white comet on a collision course for Echidnapolis within the month. With a dire situation at hand, Kayla-La and Jordann had come up with a plan to save their culture...one that the echidnas accepted and would change their culture forever. Over time, the echidnas had filed out of the city and excavated the area around the island for the Chaos Emeralds. They were able to find 12 Chaos Emeralds, which they placed in a dug-out cavern below the city. The power of the Chaos Emeralds resonated through the ground, breaking the island away from the earth. Kayla-La's calculations were correct, and the power of the Chaos Emeralds sent Echidnapolis high into the sky, just as the comet hit Mobius. While the echidnas celebrated their victory against the comet, they left behind all the others on Mobius...including a few hedgehogs. Knuckles then remembers that, despite their victory, their efforts had given rise to that great Mount Fate...and their greatest foe of all. Jordann and Kayla-La are introduced, though not by name. 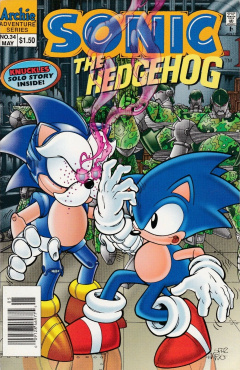 This is the first issue of Sonic the Hedgehog to have art by Brian Thomas, although he did cover art with Patrick Spaziante in the previous issue. Dulcy returns, after last being shown in issue 29. The Combots being destroyed by walking off a cliff is similar to the destruction of Robotnik's demolition tractors in issue 28. Uncle Chuck and Muttski return to Robotropolis to spy on Robotnik. This is just like Uncle Chuck's SatAM counterpart, who, upon having his consciousness returned, became a spy for the Freedom Fighters. The flying ships in the echidna past are Thunderbirds 1, 2 and 3 from the Thunderbirds series. While mapping the sky, Jordann mentions charting the Alpha Quadrant. This references the Alpha Quadrant, a portion of the Milky Way Galaxy, in the Star Trek series.